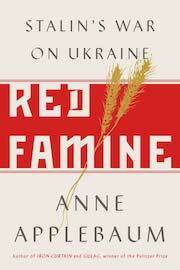 Red Famine: Did Stalin deliberately let Ukraine starve? The terrible famine of 1932-3 hit all the major Soviet grain-growing regions, but Ukraine worst of all. It was not the result of adverse climatic conditions but a product of government policies. This is, in fact, the case with many famines, as Amartya Sen pointed out in his classic study, Poverty and Famines (1981), though the deaths generally occur because of administrative mismanagement and incompetence rather than an intention to murder millions of peasants. The Soviet example is unusual in that Stalin is often accused of having exactly that intention. The famine followed agricultural collectivisation at the end of the 1920s, a formally voluntary process that was in fact coercive in its implementation. Along with forced-pace industrialisation, it was part of a package of breakthrough modernisation policies launched by Stalin in the first phase of his leadership. Industrial growth needed to be financed by grain exports, which collectivisation was supposed to facilitate through compulsory state procurements and non-negotiable prices. The problem was how to get the grain out of the countryside. The state did not know how much grain the peasants actually had, but suspected (correctly) that much was being hidden. An intense tussle between the state’s agents and peasants over grain deliveries ensued. That is a brief version of the rational account of collectivisation, but there was an irrational side as well. The Soviet leaders had worked themselves and the population into a frenzy of anxiety about imminent attack from foreign capitalist powers. In Soviet Marxist-Leninist thinking, “class enemies” within the Soviet Union were likely to welcome such an invasion; and such class enemies included “kulaks”, the most prosperous peasants in the villages. Thus collectivisation went hand in glove with a drive against kulaks, or peasants labelled as such, who were liable to expropriation and deportation into the depths of the USSR. Resistance to collectivisation was understood as “kulak sabotage”. Stalin harped on this theme, particularly as relations with peasants deteriorated and procurement problems intensified. Ukrainian officials, including senior ones, tried to tell him that it was no longer a matter of peasants concealing grain: they actually had none, not even for their own survival through the winter and the spring sowing. But Stalin was sceptical on principle of bureaucrats who came with sob stories to explain their own failure to meet targets and discounted the warnings. Angry and paranoid after his wife killed herself in November 1932, he preferred to see the procurement shortfall as the result of sabotage. So there was no let-up in state pressure through the winter of 1932-3, and peasants fleeing the hungry villages were shut out of the cities. Stalin eased up the pressure in the spring of 1933, but it was too late to avert the famine. This brings us back to the question of intention. In my 1994 book Stalin’s Peasants, I argued that what Stalin wanted was not to kill millions (a course with obvious economic disadvantages) but rather to get as much grain out of them as possible – the problem being that nobody knew how much it was possible to get without starving them to death and ruining the next harvest. But that was an argument about the Soviet Union as a whole. If you look at those regions against which Stalin had particular animus, notably Ukraine (with its border location and his paranoia about Polish spies) and the Russian North Caucasus (with its politically suspect Cossack farmers), the picture could be different. Certainly Ukrainians think so. In the version that has become popular since it declared independence, Stalin’s murderous impulse was directed specifically against Ukrainians. Holodomor, the Ukrainian word for the famine, is understood in contemporary Ukraine not just as a national tragedy but as an act of genocide on the part of the Soviet Union/Russia. As such it has become a staple part of the national myth-making of the new Ukrainian state. Anne Applebaum’s book takes her into this politically contentious territory, and her subtitle, “Stalin’s War on Ukraine”, may set off some alarm bells. An American journalist who has also worked in Britain (her husband, Radosław Sikorski, served as Polish minister for defence and for foreign affairs, and played a major role in sorting out the Maidan crisis in Ukraine in 2014, and advocated tough sanctions against Russia), Applebaum has been active as a political commentator highly critical of Russia and Putin’s regime. Her first book, Gulag: A History, won her a Pulitzer prize in 2004 but few friends among western Soviet historians, since she explained in her introduction that, as an undergraduate at Yale in the 1980s, she had decided not to join their ranks once she found out they allegedly had to curry favour with the Soviet authorities to get visas and archival access, a suggestion many saw as a slur on their professional integrity. Her remarks in the same introduction on the world’s failure to recognise Soviet atrocities as being on a par with those of Nazi Germany struck an anachronistic note. Currently she is a professor in practice at the LSE’s Institute of Global Affairs specialising in 21st century propaganda and disinformation, a subject she knows from both sides, having been involved in the mid-1990s in the Spectator’s exposé of Guardian journalist Richard Gott for KGB connections and, in 2014, and having been herself targeted by what she describes as a Russian social media “smear” campaign. Guardian readers may be inclined to approach a new book on Soviet atrocities by Applebaum warily. But in many ways it is a welcome surprise. Like her Gulag – which, if you held your nose through the introduction, turned out to be a good read, reasonably argued and thoroughly researched – Red Famine is a superior work of popular history. She still doesn’t like western academic Soviet historians much, but at least she mainly avoids gratuitous snideness and cites their work in her bibliography (although my Stalin’s Peasants is not included, but that is probably an oversight). Whereas in Gulag she tended to be grudging about her towering precursor, Alexander Solzhenitsyn, whose Gulag Archipelago was the pioneering work in the 1970s, in Red Famine she is appropriately respectful of Robert Conquest (his The Harvest of Sorrow came out in 1986). Applebaum has, of course, more material at her disposal than Conquest had, including large numbers of Ukrainian famine memoirs. Many of these are published by the Ukrainian Institute of National Remembrance, which has an obvious political agenda, but she is by no means offering an uncritical “Ukrainian” account of the famine. Though sympathetic to the sentiments behind it, she ultimately doesn’t buy the Ukrainian argument that Holodomorwas an act of genocide. 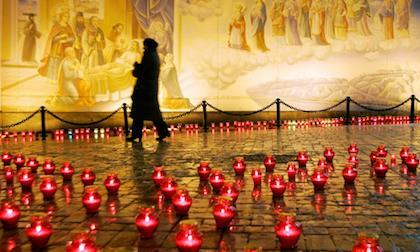 Her estimate of famine losses in Ukraine – 4.5 million people – reflects current scholarship. Her take on Stalin’s intentions comes closer than I would to seeing him as specifically out to kill Ukrainians, but this is a legitimate difference of interpretation. For scholars, the most interesting part of the book will be the two excellent historiographical chapters in which she teases out the political and scholarly impulses tending to minimise the famine in Soviet times (“The Cover-Up”) and does the same for post-Soviet Ukrainian exploitation of the issue (“The Holodomor in History and Memory”). The book has one odd quirk, namely its citation practice. As far as I can see, Applebaum has not worked in archives for this book (although she did for Gulag). Her footnotes are bulging with archival citations, however, because every time she quotes something from a secondary source that has an archival reference, she gives that as well – and then lists all these archives among the primary sources in her bibliography. This is not normal scholarly practice, though graduate students sometimes do it for effect before they learn better. But given that she was writing a popular history on a topic on which there is an abundance of recently published documents, memoirs and scholarly studies, there was no need for her to do original archival work in order to produce, as she has done, a vivid and informative account of the Ukrainian famine.